Jeep Wrangler (TJ) (1997-2002); Black/Tan. Jeep Wrangler (YJ) (1987-1995); Black/Tan. These easy to install seat covers are made from durable poly canvas. 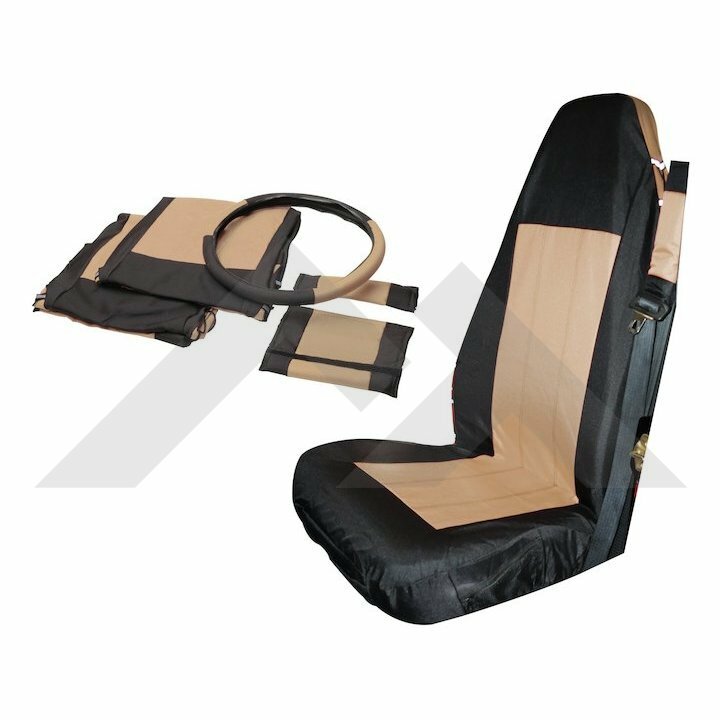 The front seat sets include 2 front seat covers, 2 shoulder harness belt pads and a steering wheel cover. The seat covers have adjustable side lace-up draw cords that create a snug fit. Front and side mounted zipped mesh pockets add convenient storage space. Large rear pockets add additional rear access storage space. Included rear carabiner clip is handy for hanging and securing small items. The steering wheel cover installs in seconds without glue or tape. The rubberized interior of the steering wheel cover allows for exceptional grip.